Jarosite crystals on matrix with very well defined faces and edges, transparent and very bright. 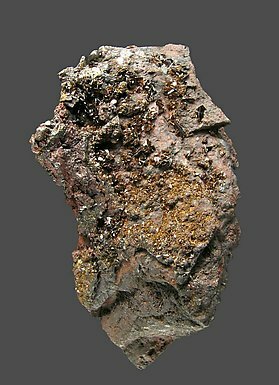 A representative specimen from the type locality. 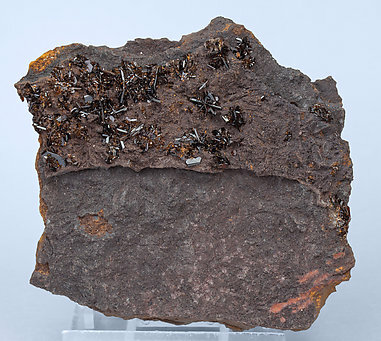 On a Limonite matrix, very bright Jarosite crystals showing a tabular habit, some in groups of rosettes and other isolated crystals with developed prism faces. Brown color is very intense and excellent transparency. NASA Opportunity Rover prospecting on planet Mars found Jarosite that may point to the rock's wet history having been in an acidic lake or an acidic hot springs environment, like in Barranco Jaroso deposit. 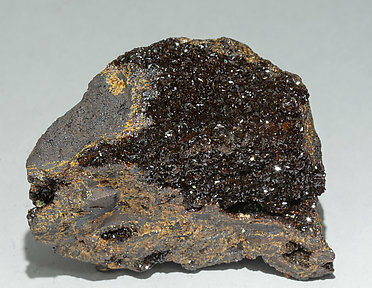 Druse of dark brown Jarosite crystals on matrix. They are translucent, very bright, have very well defined faces and edges and are with yellow very well delineated Natrojarosite crusts. 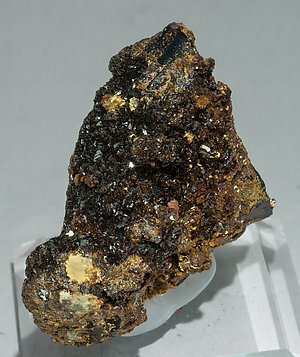 Druse of translucent, very bright, dark brown Jarosite crystals on matrix. 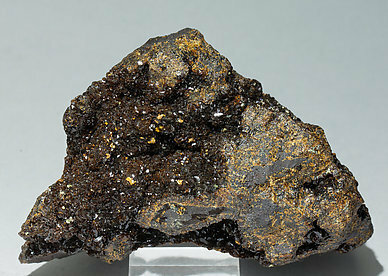 They have very well defined faces and edges and are on a matrix with vivid yellow Natrojarosite crusts also partially coating the Jarosite crystals. 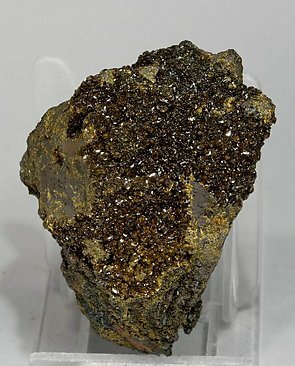 Druse of dark brown Jarosite crystals on matrix. They are translucent, very bright, have very well defined faces and edges and are partially coated by yellow small Natrojarosite crystals and crusts. 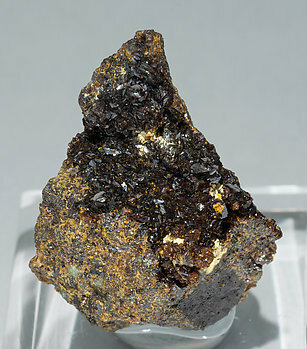 Druse of dark brown Jarosite crystals on matrix. They are translucent, very bright, have very well defined faces and edges and are partially coated by vivid yellow and white small Natrojarosite crystals and crusts. From a recent find in Lavrion (Laurium). 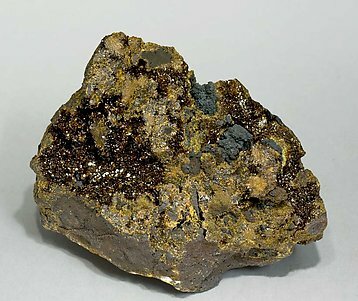 Aggregates on matrix of dark brown Jarosite crystals, very bright and partially covered by yellowish concretions of Natrojarosite. Druse of dark brown Jarosite crystals on matrix with reddish shades. They are translucent, very bright, have very well defined faces and edges and are partially coated by vivid yellow small Natrojarosite crystals and crusts. From a recent find at Lavrion. 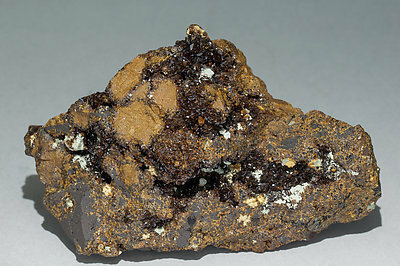 Aggregates on matrix of dark brown Jarosite crystals, very bright and partially covered by yellowish concretions of Natrojarosite and globular and concretionary growths of black Romanéchite.